Air quality is important, but many people do not put much effort towards enhancing the air that flows through their building. As the lungs to your building, the condition of the air ducts in your commercial building does matter. We understand that you may not know how to take care of the air ducts yourself, and let’s face it, who has the time to? With Steam Master Cleaning and Restoration, you can leave the worrying up to us. We provide premium commercial air duct cleaning in San Antonio for truly affordable rates. Talk to us today about all our office cleaning services and how we can help you breath clean air in your business. No matter how clean you try to keep your commercial property, there is no escaping dust, pollen, dander and dirt that lingers in the air. In time, the debris that is in the air collects in your air ducts and re-circulates throughout the entire building, directly affecting your indoor air quality. You should never risk the business you have because of the air you are breathing. With such an easy solution, there is no reason not to get the clean air you deserve! Cleaning your air ducts reduces that amount of pollutants that circulate in the air, reducing the amount you have to clean and dust as well. You may even find that your employees are healthier and less prone to allergies, sneezing, headaches, and more. By improving the efficiency of your system as a whole, it’s possible that even your monthly energy bills are less after we clean your air ducts. 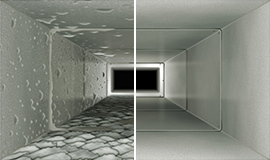 There is no better time than now to get your air ducts cleaned. Let Steam Master Cleaning and Restoration help you breathe easy. Contact us today to learn more about commercial air duct cleaning in San Antonio.